Progress on the 2000 has been non-existent since then. I also have the racing program (Austin Powerless Marina and Mustang). and the myriad of family cars. Something's got to go. I'm just not sure what (apart from the Sportsman). Well, the Marina is gone and being driven daily. Yea! However, the disposal of the 2000 Mk. I Sedan didn't work out...so...it's going to stay for a while. Additionally, we've added a 1975 TR6 race car to be that is being chronicled at my other blog, http://riffrafracing.blogspot.com. 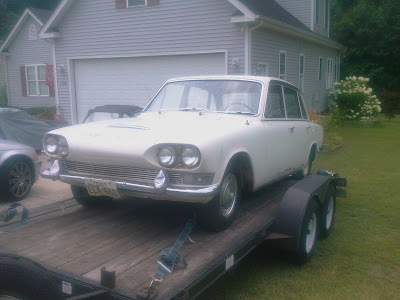 The TR6 will eventually race in ChumpCar and 24 Hours of LeMons races with my teammates. 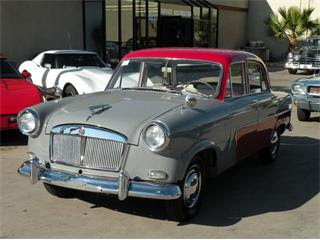 Finally, one more addition will soon be transported from Arizona...a 1956 Standard Vanguard Sportsman. In case you don't know, Standard was the parent company of Triumph. The great thing is that this car is already restored, so it won't take much time away from the Estate. That's it's picture up there resplendent in red and gray. Or is it grey? Anyway, I also looked over the front end of the Estate again and my friend Steve that is a fabrication whiz came over again...so...we know WHAT we have to do, just have to find the time to do it. Looks like the 2000 Mk. I saloon will be going away shortly. However, that replacement I alluded to in the earlier post may come to pass. More to come! Marina is almost finished, bodywork done, minor electrical issues, soft brake lines and a week of driving her to make sure she's OK and she'll be with her new owners. 2000 Mk. I sedan from the last post is going to Mike Montoya to be put back on the road much quicker than I could ever do it. Yes, I've been busy...with many different things. In celebration of finally getting internet capability back at home tonight for the first time in 2 weeks, I figured a blog post was well overdue. If you're my friends, and reading this, you wonder where I've been...well...I've been out of state a lot for work. And one other trip...that's directly applicable to this blog. Yes, there's another 2000 in the family. Why? Well...that's a long story. 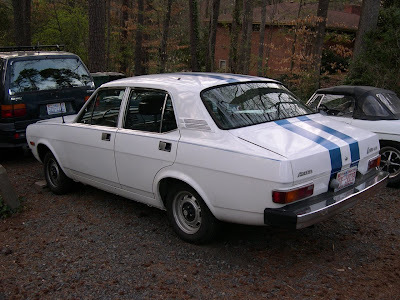 But first, there's the other British 4-door sedan to show you. Marina I couldn't turn down, as I purchased her. What you can't see in this shot is the mangled front right fender where she had met a Lexus. After frame straightening and welding the front fender and valence back together (they were about 9" apart after the wreck) she's getting closer to being roadworthy. As usual with me, I've been able to procure all the parts, but not the time. Amazing how inexpensive parts for this car are...it led to the front suspension being completely rebuilt with NOS parts, including the lever shocks. And I thought Triumphs were built to a price...NOTHING like the Marina. But it's refreshingly honest in it's simplicity. However...the Marina has already been promised to a family member pending it's completion, although with right of first refusal to get it back it may end up back home someday, and it's going to some very good folks that I know will take care of it. Why, you ask? Because we have another 2000 Mk. I in the family. Her name is Holly. Holly started out life purchased by a family in Coventry to US specs (just like the Estate we have) but this family spent some time in Holland after purchase. The family then took the car to California, and finally Houston, where I understand the original owner died. The car was kept inside and last year, I was able to connect the family, who were looking to give the car away as long as it was restored, to a likely restorer. Unfortunately, the gentleman's fortunes took a turn for the worse, and he was unable to follow through. When he offered me the car, I decided to take him up on it. He was kind enough to meet me 1/2-way from Texas, so we drove out to Nashville, and apart from two flats on the trailer (you can see one of them in the lower left of the above picture on the spare tire bracket) the trip went very smoothly. So...it's probably good that the Marina is moving on, even if it's still attached by relation. Holly is amazingly original, even down to the majority of the paint. Apart from the radiator cap and an aftermarket horn button, I can't find anything that isn't original. So...the plan is to put her back on the road as painlessly as possible, and drive her. We'll get to the cosmetics eventually. I'm hoping to get back to the Estate this fall. We'll see. It also seems that new tempting Triumphs drop into my lap every time I turn around this year. I'm currently deciding whether or not I can buy one that would put most of my other cars to shame. So watch for an update soon!